The Edge of Necessary is the first ever anthology of contemporary innovative Welsh and Wales-connected poetry in English. Wales has a strong tradition of dis-established, linguistically challenging literatures, and the distinctive work of writers such as David Jones, Dylan Thomas, and Lynette Roberts set a high standard for later poets tracking experimental lines of enquiry. This collection showcases some of the brilliant and audacious work produced by such poets over more than fifty years up to the present day, a survey both local and international in its breadth of focus. 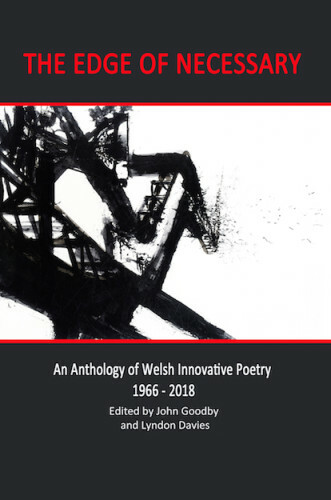 The anthology widens the scope of what Welsh poetry is by including both Welsh and non-Welsh writers domiciled in Wales, as well as others living elsewhere but with meaningful ties to the country. As varied as they are, one thing connects them all: a desire to push out beyond the formal and linguistic confines of traditional poetic practices, and to explore new possibilities of saying, seeing and being initiated by modernist/postmodernist discoveries in the realms of literature, art and ideas. Concrete poetry, surrealism and Dada, radical pastoral, the new lyric, cut-up, and the distinctively Welsh psycho-ethno-geographical tradition can all be traced here through their various emergences and resurgences, and the many interactions with, and energies drawn from Wales’ other language are evident throughout. Including – Gerard Casey, Heather Dohollau, David Barnett, Jeff Nuttall, Malcolm Parr, John Powell Ward, John James, Wendy Mulford, Chris Torrance, Peter Meilleur, Iain Sinclair, Tilla Brading, Philip Jenkins, Paul Evans, Peter Finch, Ralph Hawkins, Paul Griffiths, Phil Maillard, Chris Bendon, David Greenslade, Graham Hartill, David Annwn, Lyndon Davies, Harry Gilonis, Angela Gardner, Ian Davidson, Rhian Saadat, Christopher Twigg, Chris Ozzard, John Goodby, Elisabeth Bletsoe, Helen Lopez, Niall Quinn, Nick Macias, Samantha Wynne-Rhydderch, Nic Laight, Zoë Skoulding, Nerys Williams, Suze de Lee, Lee Duggan, Rhys Trimble, Chris Paul, Zoë Brigley Thompson, Steven Hitchins, Nia Davies, Rhea Seren Phillips. FOR ADDRESSES ELSEWHERE, SEE NON-UK SECTIONS ABOVE.